Back Cove enters the outboard market with a sporty Downeast couple's cruiser. Outboard engines have come a long way from their noisy, smoky origins. Today’s outboards are clean, quiet and reliable. Higher revving and lightweight, they provide owners with the power and maneuverability to propel all types of boats. 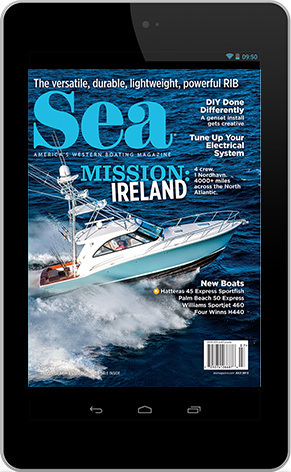 Taking advantage of this popular technology, the Back Cove 34O blends traditional Downeast styling with the speed, fun and versatility of modern outboards. Back Cove did not simply convert an existing inboard model by swapping out the engines. 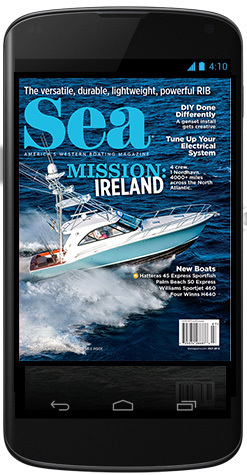 The 34O has a completely new hull specifically created for outboards. The builder’s in-house team, headed by chief designer Kevin Burns, carefully crafted this hull to maximize handling and performance. A shallower cutaway forefoot and increased deadrise up to 20 degrees help the boat accelerate and provide better control at the higher speeds and running angles associated with outboards. Additional volume aft, courtesy of a sculpted hull form Back Cove calls TRELIS (trailing edge lifting surface), increases buoyancy and helps the boat get on plane faster while offsetting engine weight aft. While this hull form is new, it is designed to ABYC, NMMA, U.S. Coast Guard and CE Category B standards that ensure quality and safety. A major benefit of outboards is speed, the downside of which is increased structural stress, especially in rough waters. Recognizing this, Back Cove refined already rigorous construction processes at its 240,000-square-foot facility in Rockland, Maine, to meet the needs of outboard power. The 34O is hand laid using vacuum infusion, and a closed-cell foam core in both the hull and topsides increases strength and reduces weight. Vinylester resins are used throughout, and stringers are co-infused with the hull to create a single bonded structure capable of handling the extreme forces encountered during high-speed operation. The hull-to-deck joint overlaps in shoebox fashion, and is fastened both mechanically and with structural adhesives for increased durability. 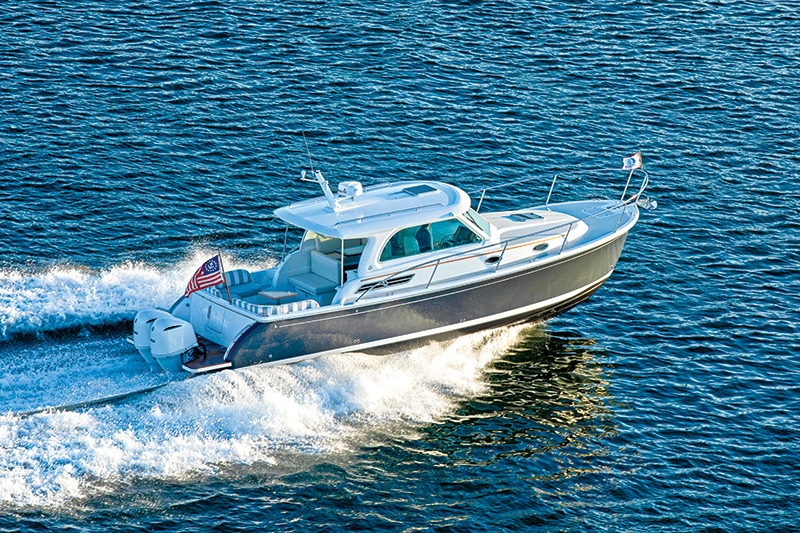 With its newly designed hull and augmented construction, the Back Cove 34O performs well and is fun to drive. Powered by twin Yamaha F300 outboards, the 34O got on plane rapidly and accelerated smoothly, hitting fast cruising speeds in a matter of seconds. During our test there was a pronounced 3-foot chop on the water, and we sped into it and cut turns through it easily while the boat’s optional EPS (electric power steering) and Zipwake automatic trim tab controls helped maintain balance. While running out through the waves at close to our top speed of 37 knots, I accidentally launched off a wave top. The boat landed soundly and everyone on board was fine, demonstrating that its design and construction augmentation works. When we backed down to a fast cruise of a little more than 30 knots, the twin Yamahas burned 38 gph, yielding a range of 178 n.m., and the ride was very comfortable. At 24 knots, range increased to 216 miles and fuel burn was 25 gph, or 0.96 mpg. Visibility is excellent fore and aft, the controls are easy to reach from the helm and the Lebroc helm seat is remarkably comfortable, even when jumping waves. A unique double footrest is easy to use while seated, and it flips down to provide added standing height when needed. Headroom at the helm is six and a half feet. 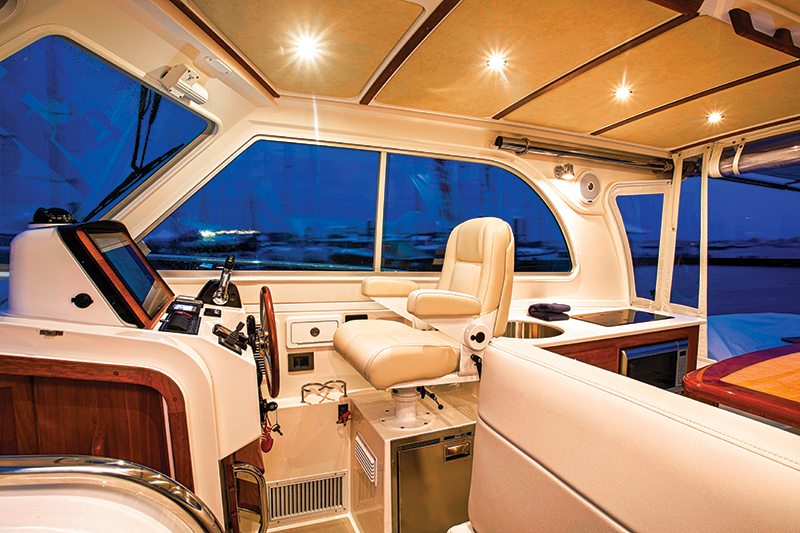 Electronics and other controls are neatly arranged around the helm, including the standard Side-Power SE50 bow thruster controls and a Yamaha EPS Joystick system, which is optional. An overhead hatch, opening side windows and the center section of the windshield provide ventilation. Reverse-cycle heat and air conditioning in the cabin is standard, as is a 5 kw Onan diesel generator. Helm air conditioning, 16,000 Btu, is an option that requires a generator upgrade to 7.5 kw. A 25-gallon tank holds the diesel. When it comes to accommodations, the Back Cove 34O is a great day cruiser and a well-laid- out weekender for couples or small families. 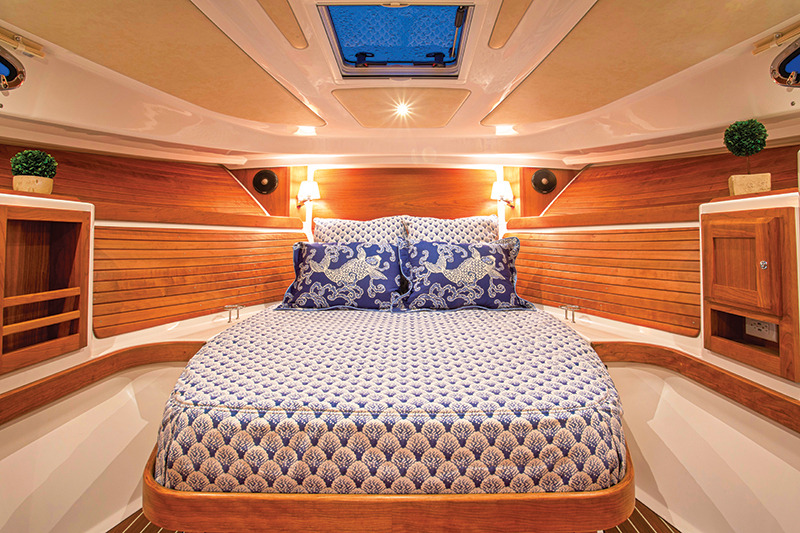 It has a molded-in hull liner decorated with bright cherry wood and laminate flooring in a teak-and-holly style. The single cabin has a centerline bed and plenty of storage in a cedar-lined hanging locker on one side and a locker with cubbies and drawers opposite. Features include an overhead hatch, opening portholes, twin lamps, bedside bookshelves, drink holders, an optional 19-inch flat-screen LCD TV/DVD, a Fusion stereo with speakers, and a cabinet with both AC and DC/USB power for charging. One feature I really like is the separate head and shower. The head is to port and the shower is in its own compartment to starboard. Both have opening portholes and the shower has 6 feet, 3 inches of headroom, a bench, an adjustable showerhead and something I never really thought of but like: twin drink holders. The port side of the salon contains a large and very versatile seating area with a varnished teak table. 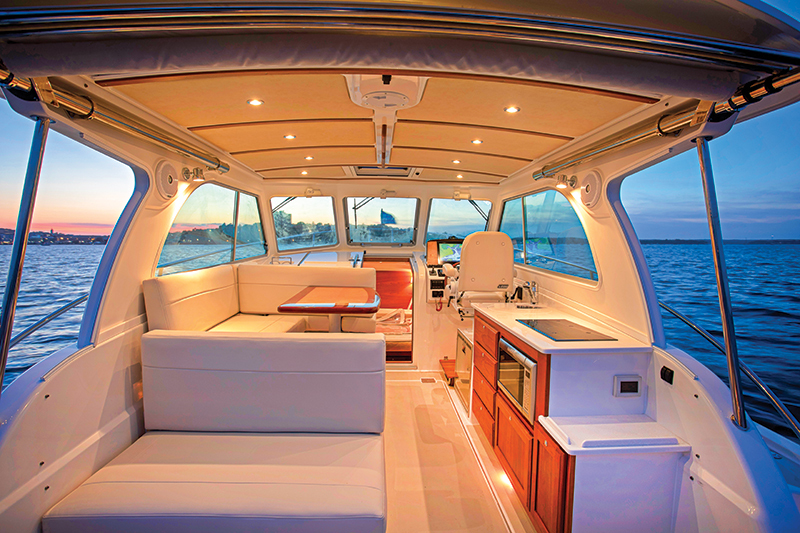 The forward section of the dinette seating flips to create a forward-facing bench companion seat when the boat is running. The aft section flips down to create rear-facing seating into the cockpit. The table folds down and a filler cushion goes atop it to serve as a second bed. Opposite the dinette, the galley has a microwave, an electric two-burner cooktop, a drawer style AC/DC refrigerator, and a solid-surface countertop with a deep stainless sink and drop-in cover. Additional Vitrifrigo refrigerator/freezer drawers and an ice-maker can be added. Another added benefit of outboard power is storage, and on the Back Cove 34O the entire salon area rises up on hydraulic rams to provide access to a 24-square-foot cargo area (accounting for the space taken by cabinets, tanks, etc.). On an inboard-powered boat, this would be the engine room, and it still houses some clearly labeled and wired electrical panels, tank access, a battery charger and an optional inverter along the aft bulkhead. Along the sides of the compartment Back Cove provides finished storage cabinets with doors. The center section has a stainless ladder, since it is 3 feet deep. I measured 5 feet, 8 inches cabinet to cabinet and 5 feet, 11 inches fore and aft in the center, which means there is plenty of room for inflatable kayaks or paddleboards, fishing rods, coolers, paddles and other types of inflatable boats. Additional storage is in the cockpit beneath twin cushioned L-shaped seats and in a lazarette below the floor. Removable tables, a centerline filler cushion and a SureShade retractable awning are cockpit options. The centerline transom door leads to the swim platform, which on our test boat was clad with optional teak and complete with an undermount stainless swim ladder. 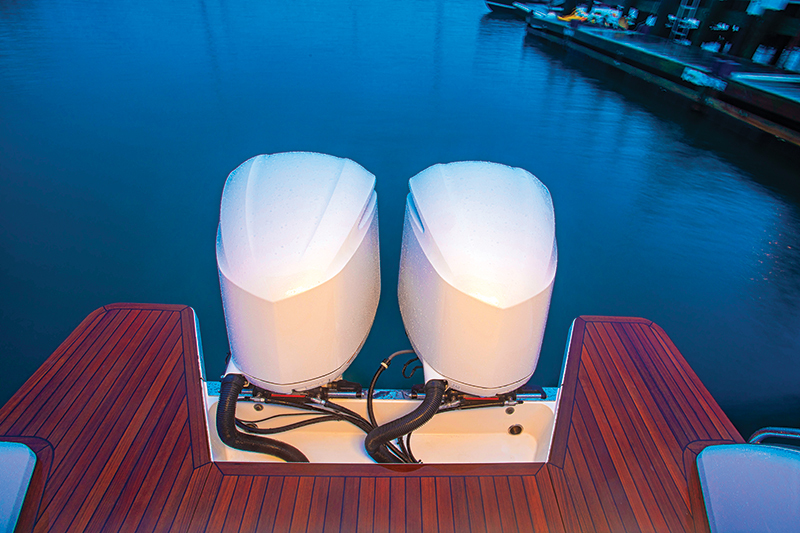 The twin Yamaha outboards were painted a pearly white on our test boat to contrast nicely with its shark blue hull. The Back Cove 34O is packed with useful amenities and accommodations that are well thought out and great for entertaining or for a weekend — perhaps even weeklong — trip. With outboard power, it is nimble and fast yet still a solid cruiser worthy of her Maine-built pedigree. LOA: 38 ft., 11 in. Beam: 11 ft., 10 in. Draft: (outboards down/up) 3 ft./2 ft.
Twin 300 hp Yamaha 4.2L V-6 outboards, hot/cold cockpit shower, heavy-duty trim tabs, SeaStar hydraulic steering, Side-Power bow thruster, microwave, Fusion stereo system, two-burner electric cooktop, and more. Twin Suzuki 4.4L V-6 350 hp outboards, twin Yamaha 5.3L V-8 350 hp outboards, 7.5 kw genset, 19-inch LCD TV in cabin, 1,800- watt inverter, Joystick Docking System, SureShade Silent Glide cockpit awning, teak decking on swim platform, convection/ microwave and more. 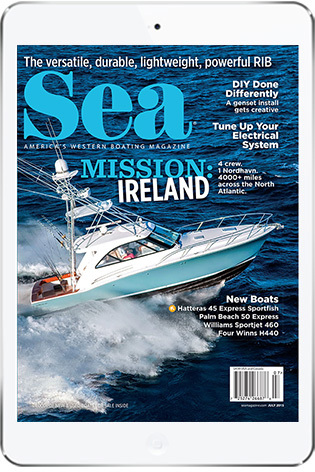 This entry was posted in Boat Tests New and tagged Yamaha Outboards, Back Cove Yachts, Down East Yachts, Back Cove 34O by Stephanie Shibata. Bookmark the permalink.